Urban trees have their highest value while living. When these trees need to be removed, they should be put to their highest and best uses to maximize their economic, environmental, and societal benefits for people in urban areas and beyond. Sustainable recovery and the highest and best use of urban forest products are essential components of sustainable urban forestry. Increased end user demand for urban forest products is essential to increasing demand all along the wood use chain and producing benefits throughout the urban forest sector. 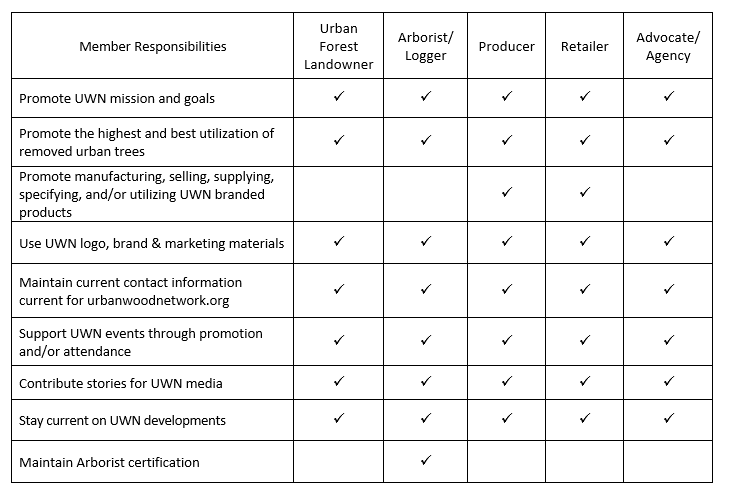 The Urban Wood Network will effectively achieve its mission through collaboration and information sharing. 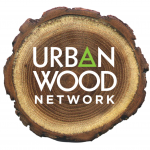 The Urban Wood Network is committed to work in partnership with the full diversity of stakeholders that share our vision and mission. Urban wood is defined here as wood from trees NOT harvested for their timber value, but removed because of pests, disease or circumstance. Members who supply urban wood may also use UWN marketing materials to promote other types of urban reclaimed wood products, such as “waste” wood from other wood product manufacturers and wood retained from deconstruction, although this is not the primary focus of the program. 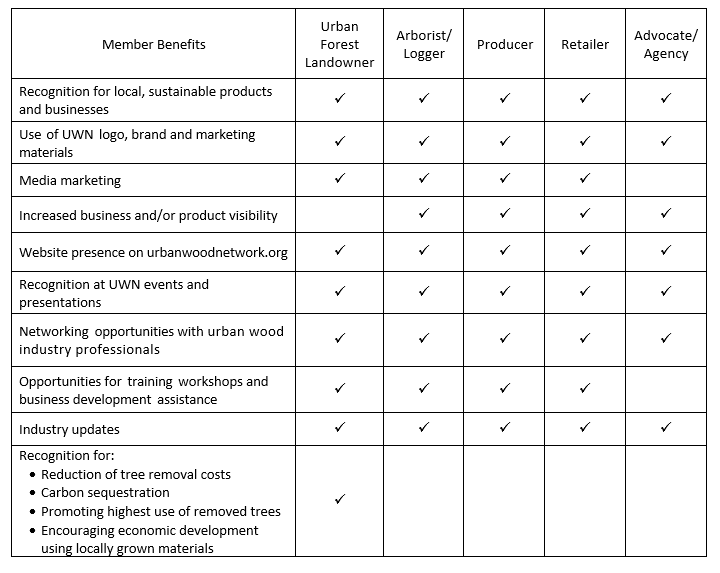 Note: Members may also work with traditionally logged timber; however, these products must be kept separate from UWN products and will not carry the UWN logo. Annual membership is for January 1 through December 31. Membership fees are determined by the UWN Steering Committee and are due by March 15. Membership fees will be revisited annually to ensure that they cover ongoing costs while remaining affordable for members. The membership will be surveyed at least once each year to provide input on UWN issues. The success of UWN rests on the professionalism and product quality of all of its The work of any member reflects on all of the others in the group. UWN reserves the right to remove a member should an issue of professionalism or product quality arise. The removal of a member must be approved by a majority of Steering Committee members and will be done only as a last resort if other interventions are unsuccessful. If membership requirements are not fulfilled, the member in violation will receive a one-month warning to rectify the If, after one month’s time, the requirement is still not met, the member will be removed from the UWN and all rights and benefits outlined herein will be withdrawn. Urban Wood Network is an equal opportunity organization. Organizationally, the Urban Wood Network is a subsidiary of Sustainable Resources Institute, a 501c3 non-profit organization specializing in natural resource research, education, training and certification. Business/Organization Description. Business/organization type, service area, production, etc. On behalf of my business or organization, I agree to the roles and responsibilities as outlined above and to the terms and conditions of this membership agreement. After clicking submit, you will be directed to the payment page. You can pay by credit card or PayPal. The 2019 membership fee is $50. We use PayPal as our payment processor. You do not have to have a PayPal account to pay using a credit card (see instructions on bottom of next page). Read this PDF document in its entirety – “Membership Agreement – Fillable PDF“. Fill out the fillable part at the end of the above PDF document. Print the document with that part filled out. Mail the printed document to the address at the end of the document. Questions? Contact the Urban Wood Network at info@urbanwoodnetwork.org or (906) 875-3720.